In situations where hygiene is poor and people’s health is weak, diarrhoea can be a killer disease. In fact, it’s the second cause of death of children under five worldwide. When 20,000 Somali refugees suddenly arrived at the Kambioos refugee camp in Kenya there weren’t many toilet facilities and people weren’t that aware of the link between hygiene and disease. Ahmed Hussein arrived as a refugee. He’s now a hygiene promoter in the camp. When he arrived conditions were difficult. Catholic Relief Services (CRS – one of Caritas’ US members) set about ensuring the camps inhabitants’ survival in the harsh desert conditions. 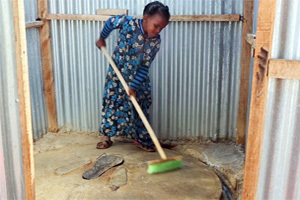 To curb the spread of disease, Catholic Relief Services began building latrines and training refugees such as Ahmed in hygiene and hand-washing in the newly built Kambioos Camp. The two-year US$ 8,8 million (€6.4 million) project was funded by Caritas confederation member organisations and aimed to improve sanitation and hygiene in the camp. It helped the people in the camp build latrines, gave them cleaning supplies and helped people understand the importance of hygiene in staying healthy. They promoted hygiene through such initiatives as “global hand-washing day” during which role play and performance were used to get the message across. Hygiene promoters were also trained to help spread the message among the camp’s 20,000 residents. Over 3000 household latrines were built and clean-up campaigns were held every month to ensure that rubbish didn’t build up. Dozens of solid waste managers also helped ensure that the camp didn’t become a dumping ground.